My blog about things that strike me as interesting, funny, crazy or plain wrong. I had some respect left for the now retired David Millar, after his unusually frank and open statements following his drug ban, but here is his lame excuse for not testifying to the UCI’s CIRC drug commission, while finding the time to write a page long newspaper article in response to it for the Daily Telegraph. Chris Froome seems to have found time to testify, and Froome’s cycling commitments seem to be a little more demanding than Millar’s, even when Millar was active. What a self serving position to take! I’m afraid Millar is not on my reading list any more. I’ll just have to live with not being on his – as usual! While I’m on the topic, I’d say cycling is well rid of the previous hierarchy (pending honorary positions being removed) and well done to Brian Cookson on opening the can of worms, as he put it, while fully expecting worms to be found. Some of those worms must be turning very rapidly just now as they seek to explain away their actions during the years prior to the Cookson leadership. How refreshing that an international sports body chooses to publish a report on its activities, warts and all. Sepp Blatter please note. Hopefully he will go the way of McQuaid and Verbruggen, and the bitter truths of the award of the hosting of the forthcoming World Cups will emerge. I see a lot of Tyler Hamilton’s “The Secret Race” in the coverage of the report; especially the parts about ineffectual testing protocols that virtually invite athletes to micro-dope overnight. The disappointment to me is the part about lower level youth and amateur drug taking which I saw in the late 50s/60s (little coloured uppers and downers allegedly) but hadn’t considered was still an issue. Trickle down effect I suppose, as with other sports and so-called role models. On the matter of protocols, even in the case of the Astana team’s (eventually) self-admitted 5 doping instances and the history of their management, the new UCI leadership has to go through the same legal and commercial hoops to get anything done about it (pending review Cookson has demanded of Astana’s permission to race in 2015 in the light of the Italian(!) allegations). Those protocols, like the doping ones, will take some time to batter (Blatter?) into shape. There’s no way anyone can be as bad as McQuaid and Verbruggen, and to that extent I have hopes of Cookson making a difference. The CIRC report is a start, but has its limitations. I repeat my FIFA point in this way – Cookson’s intent is a lot clearer, judging by his actions, than Blatter’s. I’ll be realistic in my expectations, not cynical, if I can! 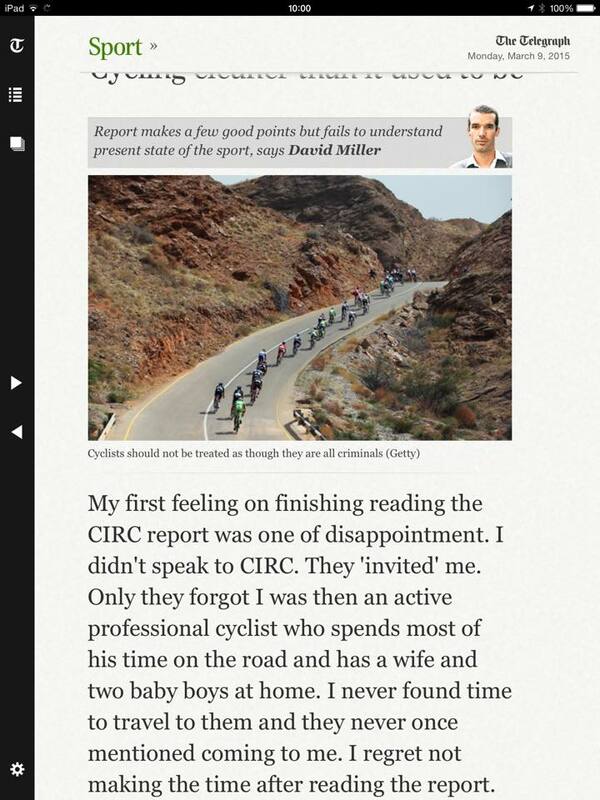 Cycling Weekly’s report seems be be “an appropriately nuanced” review of the UCI’s CIRC report! Therapeutic Use Exemptions and testing protocols (eg night-time tests) seem feasible targets for improvement. I thought the comment on “frame-motors” was interesting as it came from the interviewees. There has been rumour, speculation and some videos on this topic. Can it really be true? !